The ECOntainer, to be located in Israel’s Ariel Sharon Park, is the design work of Tel Aviv-based Yoav Messer Architects. Their bridge envisions taking 28 used shipping containers and laying them two-aside, end-to-end, to create a 160 meter span. The bridge will include observation decks and museum-like environmental exhibits. For those reasons, most visitors will be crossing the ECOntainer by foot, though the bridge will also be used by bicyclists and the park’s shuttle bus. By using shipping containers as their primary material, the designers greatly reduced the cost compared to factory-ordered metal. They also limited the impact of the actual construction process — the modular nature of shipping containers allows for 70% of the bridge’s construction to be completed off-site. 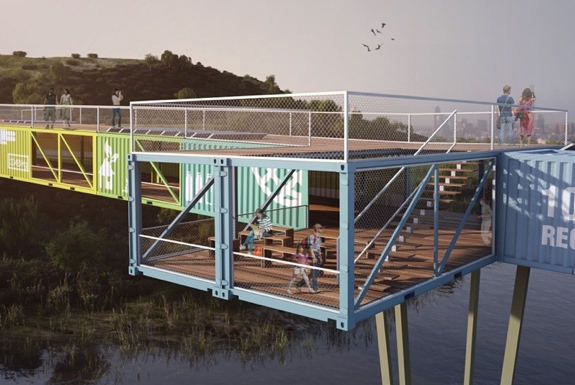 But the most important reason for this particular bridge upcycling shipping containers might be symbolic. Ariel Sharon Park, on the outskirts of Tel Aviv near Ben Gurion International Airport, sits on what was once Israel’s largest garbage dump! Since 2001, local authorities have been working on transforming Israel’s greatest environmental eyesore into one of the country’s most beautiful natural areas. Already completed is the Hiriya, a 60-meter high flat-top mound (pictured to the right). From the top one can gaze out, Moses-like, upon the Mediterranean Sea and the Mountains of Judea (and the skyscrapers of Tel Aviv, which as a vista, we suppose, isn’t so Moses-like). The view is spectacular enough to make you forget that you are standing on 25 million tons of trash. Using old shipping containers to build a bridge, then, fits into the park’s mission of eco-rehabilitation. 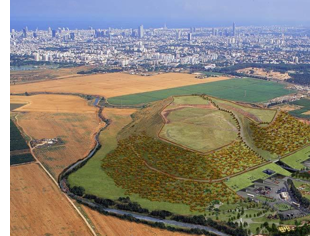 In addition to the bridge, Ariel Sharon Park will include gardens, bicycle paths, a bird watching preserve, an agricultural school, an environmental education center, boardwalks, cafés and 50,000-seat amphitheater. When completed, it will be the largest urban park in the world — more than three times larger than Central Park in New York City. It’s enough to make you never look at trash in the same way again.